What up, folks? I know I've been a bad blogger lately and I do so apologize. My birthday is coming up in less than two months (not to mention Christmas) and lately I have been obsessing over making a giant wish list. Perhaps I shall share with you soon. 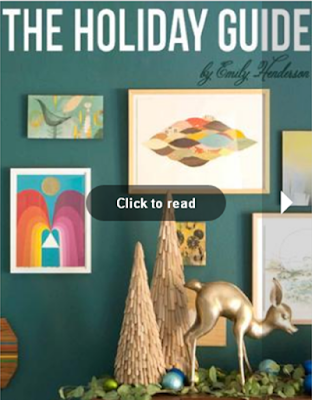 But today is for sharing The Holiday Guide 2011 by Emily Henderson. It features 500+ gifts and some great cameos by some awesome bloggers out there as well. So definitely have a look-see; there are some great gift ideas in there for everyone on your list!